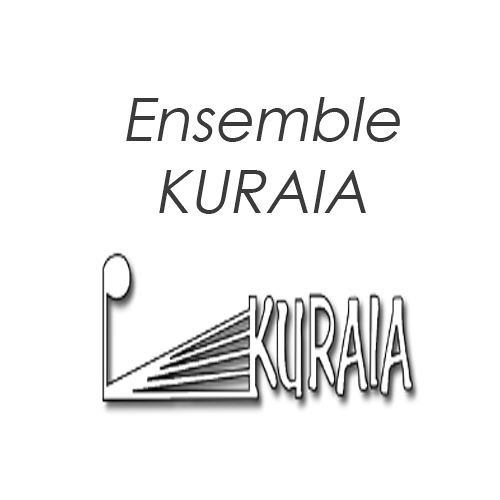 ENSEMBLE KURAIA WAS FOUNDED IN BILBAO IN 1997 BY THE COMPOSER MARÍA EUGENIA LUC, ITS CURRENT ARTISTIC DIRECTOR. THE GROUP'S MAIN GOAL CONSISTS IN MAKING CONTEMPORARY COMPOSERS' WORKS AVAILABLE TO A BROADER PUBLIC, WHILE PROVIDING THE COMPOSERS WITH A HIGH QUALITY ENSEMBLE THEY CAN COLLABORATE WITH. KURAIA HAS PERFORMED ALL OVER SPAIN AND ABROAD (BERLIN, MILAN, PARIS, MEXICO CITY…), WINNING ACCLAIM FROM BOTH THE GENERAL PUBLIC AND THE SPECIALIZED CRITICS (“AN EXCELLENT INTERPRETATION"-RITMO-, “AN EXCELLENT ENSEMBLE" -DOCENOTAS-, "SOLID AND VERY CAPABLE" -EL DIARIO VASCO, SPAIN-, "OF THE HIGHEST QUALITY" -EL COMERCIO, PERU). ALL ITS MEMBERS STAND OUT AS BRILLIANT TECHNICIANS WITH GENUINE MUSICAL QUALITIES, BACKED UP BY THE EXPERIENCE OF A SOLID PROFESSIONAL AND SOLOISTIC CAREER. HIS LAST CD "DE AIRE Y LUZ" DEDICATED TO MUSIC BY LUC RECEIVED IN 2016 THE GOLD AWARD BY MELÓMANO REVIEW. OTHER PROJECTS INCLUDES PORTRAIT CONCERTS OF IMPORTANT SPANISH COMPOSERS SUCH AS LUIS DE PABLO, JOAN GUINJOAN, FÉLIX IBARRONDO, JOSÉ MANUEL LÓPEZ LÓPEZ, AND ALSO THE PREMIERES OF NEW CHAMBER OPERAS AND MUSIC THEATER PRODUCTIONS, AMONG WHICH WE COULD MENTION SOME XXTH CENTURY MASTERWORKS SUCH AS "L'HISTOIRE DU SOLDAT" (STRAWINSKY) OR THE CZECH COMPOSER VIKTOR ULLMAN'S OPERA “DER KAISER VON ATLANTIS”. KURAIA ENSEMBLE COMMISSIONS NEW WORKS FROM COMPOSERS AND OFTEN DEVELOPS NEW MUSIC AWARENESS PROGRAMS IN COLLABORATION WITH THE UNIVERSITÄT DER KÜNSTE AND MUSIKHOCHSCHULE IN BERLIN, THE GUGGENHEIM MUSEUM IN BILBAO, THE BASQUE COUNTRY UNIVERSITY (UPV-EHU) AND THE BILBAO CONSERVATORY "J.C.ARRIAGA". ENSEMBLE KURAIA COUNT WITH SPONSORSHIPS BY CULTURE MINISTRY-INAEM OF SPANISH GOVERNMENT, BASQUE GOVERNMENT, DIPUTACIÓN FORAL DE BIZKAIA, ETXEPARE BASQUE INSTITUT.